Following up on Day 23's Menger-sponge-slice coaster, today we print four different slices of a Level 3 Menger Sponge. There are four more interesting slices that we'll print tomorrow. These were constructed in Tinkercad after importing a Menger sponge that was created in Mathematica (although we could also have imported one built in Minecraft; see Day 108). 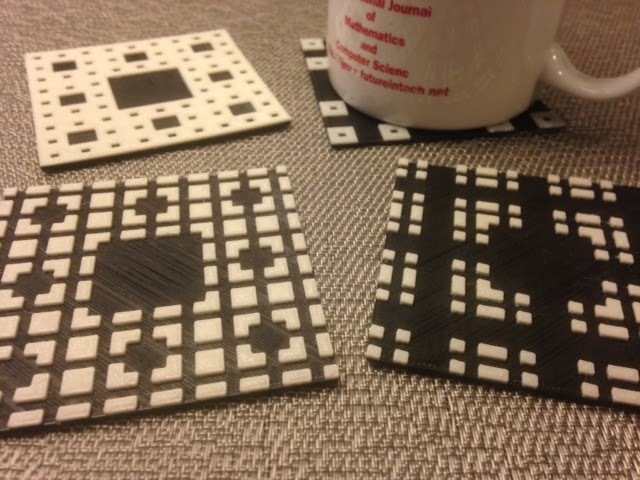 Settings: Makerware .3mm/low in about 30 minutes per coaster. The filament color swap takes place just after the 20 minute mark. Technical notes: With the settings above, the first four layers will be black, but the last of those four will have outlines around the soon-to-be-white areas. Be sure not to stop too early; wait until you are sure the white part is being drawn before swapping the filament. Getting a little black under the white won't hurt, but getting any unwanted white over the black will be unacceptable.